This past Saturday, my friend Megan and I volunteered for the Open House at PCOM. All graduate programs were represented, tours were given, and faculty, staff, and students were available to answer any questions from prospective students. Megan and I hung out at the School Psychology table and answered so many great questions about the MS and EdS programs, as we have experience in both. A lot of prospective students were coming from the education field and wanted a new and different experience within a related field. Some even made a road trip of it and came down from New York for the day! After about an hour of manning the table, faculty members presented about the background and need for the field of school psychology and program specifics such as admissions requirements, course sequence, and experiences throughout the programs. Best of luck to those who have applied and everyone who may be considering a great graduate degree experience at PCOM! 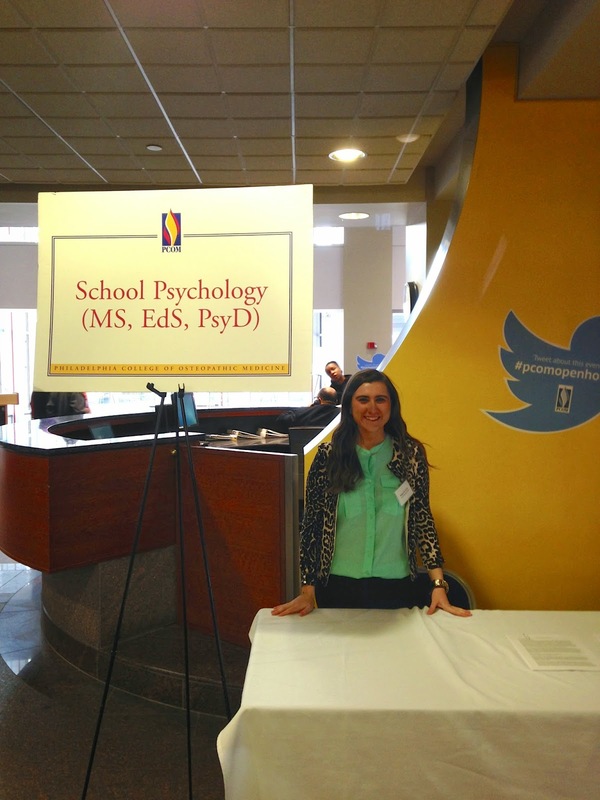 Megan ready to get everyone excited about School Psychology at PCOM!